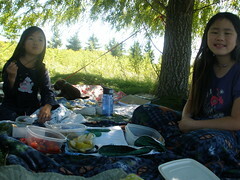 The girls, Eenie (the cat), and I packed up a little picnic and brought it out to the willow tree in the south pasture. Spread blankets out, had a light lunch with vegetables and fruit from the garden as well as some other goodies and suprises (like fairy bread – bread spread with butter and topped with sprinkles), and read books. It was such a nice break from doing homeschooling inside, and a wonderful way to enjoy part of the day. The willow tree has grown so tall and wide in only a few years, and it was nice to sit in the shade as the wind blew gently from the north. 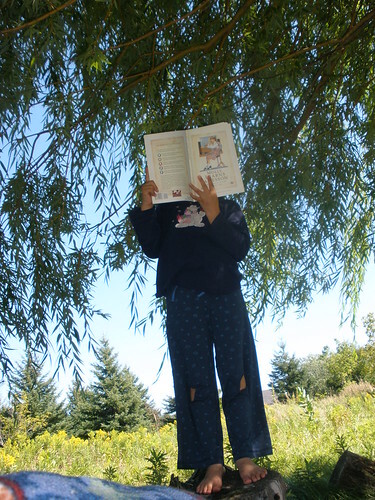 The tall grasses and clear blue sky surrounded us as we read from different books. 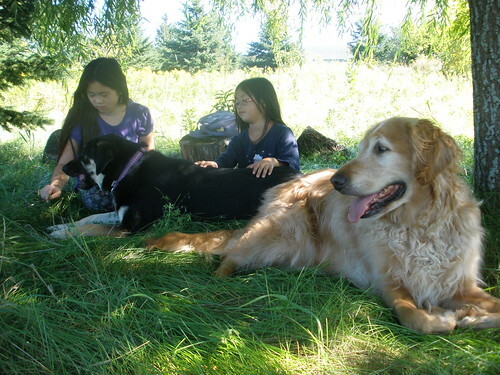 The girls, dogs, and I took a walk a bit earlier in the day and ended up under the willow tree. That’s where their idea for a picnic originated.